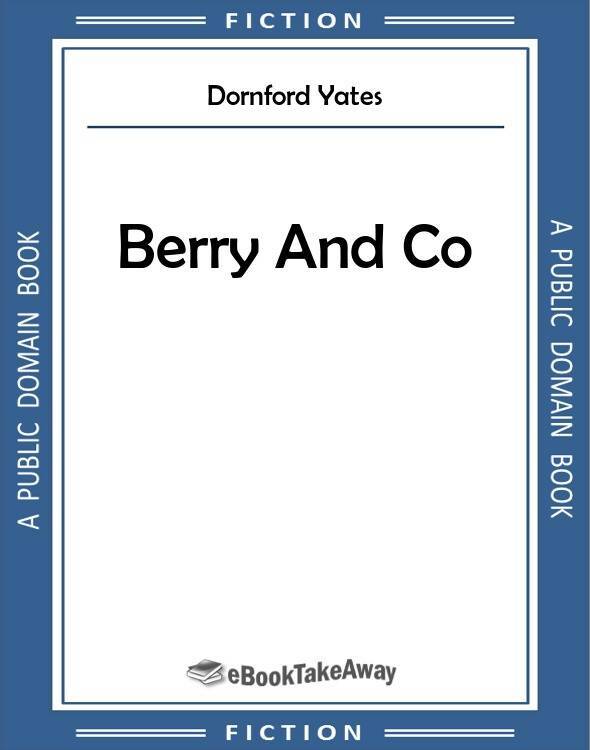 Read an excerpt and download Berry And Co by Dornford Yates for iPhone, iPad, Nook, Android, and Kindle in PDF and all popular eBook reader formats (AZW3, EPUB, MOBI). HOW WILL NOGGIN WAS FOOLED, AND BERRY RODE FORTH AGAINST HIS WILL. "Who's going to church?" said Daphne, consulting her wrist-watch. My sister turned to Jill. "Are you coming?" she said. "Berry and I are." "I beg your pardon," said her husband. "Of course you're coming," said Daphne. "Not in these trousers. This is the first time I've worn them, and I'm not going to kneel in them for any one." "Then you'll change," said his wife. "You've plenty of time." "This is sheer Bolshevism," he said. "Is not my soul my own?" "We shall start," said Daphne, "in twenty minutes." It was nearly half-past ten in the morning of a beautiful summer day, and we were all taking our ease in the sunshine upon the terrace. It was the first Sunday which we had spent all together at White Ladies for nearly five years. So far as the eye could see, nothing had changed. At the foot of the steps the great smooth lawn stretched like a fine green carpet, its shadowed patches yet bright with dew. There were the tall elms and the copper beech and all the proud company of spreading giantswhat were five years to them? There was the clump of rhododendrons, a ragged blotch of crimson, seemingly spilled upon the green turf, and there the close box hedge that walled away the rose-garden. Beyond the sunk fence a gap showed an acre or so of Bull's Meada great deep meadow, and in it two horses beneath a chestnut tree, their long tails a-swish, sleepily nosing each other to rout the flies; while in the distance the haze of heat hung like a film over the rolling hills. Close at hand echoed the soft impertinence of a cuckoo, and two fat wood-pigeons waddled about the lawn, picking and stealing as they went. The sky was cloudless, and there was not a breath of wind. The stable clock chimed the half-hour. My sister returned to the attack. "Yes," said I. "I am." Berry sat up and stared at me.